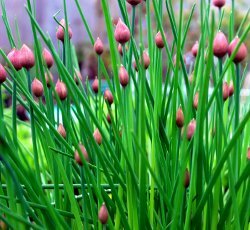 Chives wave their hollow leaves (known as “straws”) gently in the breezes, their purple buds dancing along with the beat. I think they are trying to attract attention. They are mentioned only in passing in chapters on alliums. Yet they can be found in most herb gardens and kitchen gardens. They are shunted off to footnotes because they are so common, and so easy to grow. Chives taste like onions, only much milder. The flower buds, however, are spicy hot. A friend told me to rim the garden with chives to keep bugs at bay. I don’t have enough chives to do that, but it would probably work. The flowers in bloom attract outrageous numbers of bees. Plant them around areas where you want to attract pollinators. I’ve heard that, in a pinch, you can use them to ward off evil and vampires. Harvest chives by cutting the straws at the base, just enough for dinner. They’ll grow back. Don’t do what I have done: give your chive clump a flattop haircut, or worse, a mohawk. The straws did grow back, eventually. Have you ever had a baked potato without the sour cream and chives? Why is that combination so familiar, and where did the recipe come from? 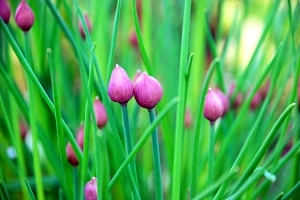 Chives are perfect for garnishing that soup or salad or potato. So, can they be used for anything other than garnish? Well, in my web searches there are few recipes for dishes made with chives. Here’s one that uses chives and mustard in a sauce with chicken. And here’s one for flaming caribou steaks (what?). There’s no chive soup, or grilled chives, or chive salad. This is probably why most people grow a single clump of chives. Nobody needs two cups at a time. If you have a recipe that calls for more than a tablespoon of chives, leave a comment. 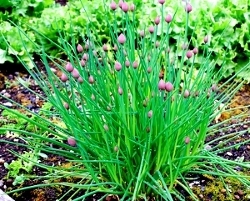 Here’s a link that may help you identify your plant: chives photos. Be sure to identify correctly before eating anything in the garden. I had a pot of garlic chives years ago, and in a fit of garden cleanup I must have put them on the compost pile. Yikes. I don’t recall that mine re-seeded themselves easily. If you find that you do have garlic chives, return here and post a recipe for them. I think I used mine on baked salmon. Maybe I’ll get some again this spring. My chives have white blossoms and wider leaves which are flat,not rounded nad hollow. Are thse garlic chives? Can you tell me more about them? They spread/reseed easily. very interesting site, really usefull and informative I will bookmark it and come back again. keep up the great work. We live on the shores of Puget Sound, across from Seattle. We moved here in 1999, and slowly began building vegetable gardens, herb gardens and planting berries, edible bushes and trees. This blog is about keeping track of our food garden. We have never been very good at garden event logging. Things like planting dates, sprouting times, first frost, last frost, when things flower (read “bolt” in the vegetable garden), when we dug the potatoes or pulled the garlic. These are important things to know when growing food. So, here it is - our garden log. Please leave comments on our articles, and definitely pass on advice. We are learning to grow food, and finally are trying to get slightly serious about doing it successfully. So, welcome. Browse around. Leave comments. We can always learn something new.